Organised in Dubai on the occasion of the 44th edition of Arab Health, today’s conference discussed widespread nutrition myths and provided in-depth insight into the health benefits of a Mediterranean diet. It tapped into the diet’s crucial role in the successful prevention of non-communicable diseases (NCDs) such as cardiovascular disease, diabetes and obesity. This is a particularly important topic for the UAE where cardiovascular disease is the leading cause of death; across the Emirates around 1 in 10 residents live with diabetes and 47.5 percent of citizens are considered overweight; and reducing these rates is a high priority. In collaboration with the Embassy of Italy in the UAE and the Federalimentare (The Federation of the Italian Agri-Food Industries), the conference’s speakers included HE Liborio Stellino, Ambassador of Italy to the UAE who opened today’s event by highlighting the important role of awareness of food safety and nutrition. HE Liborio Stellino said, “Italy believes it is of the utmost importance to raise global awareness of food safety and healthy nutrition, against any shortfalls in trade regulations that have only the effect of misleading consumers in their choices. It is not by chance that the Mediterranean diet has always been widely recognised by UNESCO and included in their Intangible Cultural Heritage of Humanity list, due to the values the diet embodies. Italian agri-food manufacturers respect this heritage daily providing high-quality and natural ingredients. HE Patrizio Fondi, Ambassador of the European Union to the UAE joined four experts on the subject from Saudi Arabia, Italy and Germany at today’s conference. 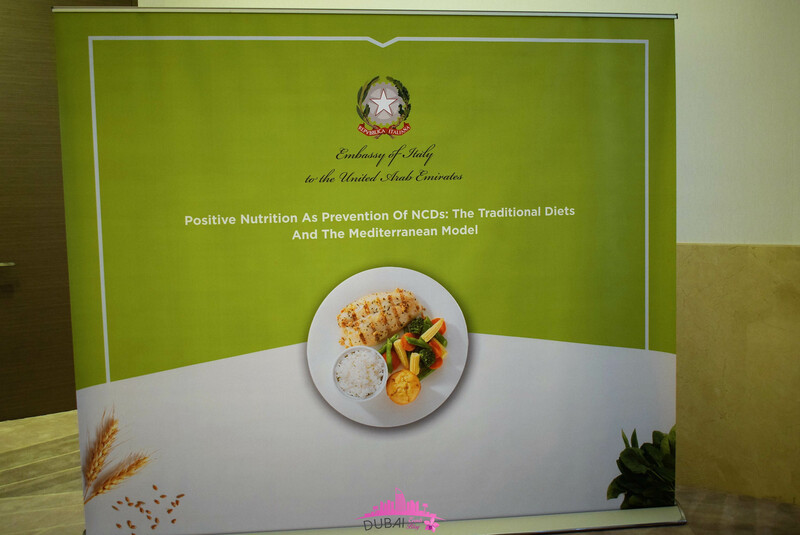 The event saw strong attendance by UAE government representatives, diplomats, regulatory officials, nutrition specialists and industry professionals. An open and engaging panel discussion also took place between key stakeholders including Dr. Lateefa Rashed from the UAE’s Ministry of Health and Dr. Yousef Alsaadi, Director of Technical Legislations at ESMA, on the most effective strategies to reducing the prevalence of NCDs in the UAE. During the discussion – which was moderated by Rola Arab, Founder and Manager Director of RA Consulting – a number of important subjects were broached ranging from public health interventions and nutritional misconceptions to recommended national nutritional framework models and the dietary guidelines of the Mediterranean diet. A Mediterranean diet is comprised of fresh fruits, vegetables, whole grains, legumes as well as healthy fats (such as Extra Virgin Olive Oil, nuts and seeds) and fresh fish. It excludes butter or refined grains and typically includes less meat and dairy than a Western or Middle Eastern diet. Dr. Al-Madani was joined by Dr. Luca Piretta, Physician Specialist in Gastroenterology and Digestive Endoscopy and a Specialist in Human Nutrition Science at the Department of Clinical Sciences, Campus Bio-Medico University of Rome; Prof. Daniele Del Rio, the Head of the School of Advanced Studies on Food and Nutrition at the University of Parma in Italy; and Deftel Brendel, Crisis Trainee & Specialist in communication solutions in antitrust proceedings from Germany. Federalimentare represents, protects and promotes the Italian Food and Beverages Industry, the second-highest-ranking Italian manufacturing sector which accounts for 8% of the national GDP, with an annual turnover of over 137 billion Euro. The Italian trade Associations for each food and drink sector are grouped together under Federalimentare, which represents almost 7,000 companies with more than 9 employees each, located throughout Italy.